Asexual blood stage smac::mCherry signals detected in all blood stages, both in the cytoplasm of the parasite and in the cytoplasm of the infected erythrocyte (see 'Additional remarks phenotype'). The mutant expresses a (C-terminal) mCherry-tagged version of Schizont Membrane Associated Cytoadherence protein (SMAC). The blood stages of the smac::mCherry parasites showed strong mCherry-fluorescence in the cytoplasm of the host erythrocyte demonstrating export of SMAC into the host erythrocyte. In synchronized blood stages weak SMAC::mCherry was detected in the cytoplasm of developing trophozoites (5 to 12 h). Fluorescence increased in maturing trophozoites and schizonts with a patchy fluorescent signal in the cytoplasm of red blood cells infected with immature and mature schizonts. SMAC::mCherry was not observed at or close to the irbc surface membrane. Staining of live SMAC::mCherry and wild type infected erythrocytes with anti-mCherry or anti-SMAC antibodies did not provide evidence for exposure of SMAC on the surface of infected erythrocytes. Phenotype analyses of mutants lacking expression of SMAC (RMgm-661, RMgm-662) indicate that asexual blood stages show a reduced growth rate in mice (see 'Additional information'). Phenotype analyses of mutants lacking SMAC-expression (RMgm-661, RMgm-662) indicate that that the reduced growth rate of blood stages in mice is not the result of a prolonged cell cycle (schizogony) or a reduced number of merozoites produced per schizont. Evidence is provided that parasites lacking SMAC-expression have a reduced capacity to adhere to the host receptor CD36 resulting in a strongly reduced CD36-mediated sequestration phenotype. The non-sequestering parasites have a reduced growth and evidence is provided that in addition to avoiding spleen removal other factors related to CD36-mediated sequestration are beneficial for parasite growth. Additional remarks genetic modification To generate transgenic parasites expressing SMAC that is C-terminally tagged with mCherry construct pL1419 was generated. 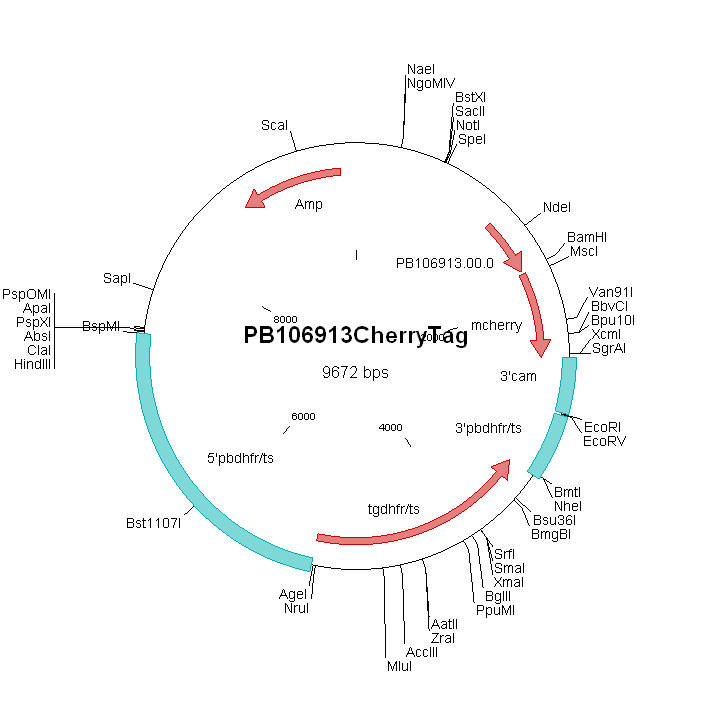 First the mCherry gene of pL0017-mCherry (Graewe et al., 2009) was cloned into pL0017eGFPcam (BamHI/XbaI). Next, the mCherry expression cassette of pL0017mCherrycam was subcloned in pBluescript (BamHI/EcoRI) and then cloned (HindIII/EcoRI) into pL0001 to obtain the mCherry-tagging vector. Finally, the smac targeting region (primers 3774-3775; SpeI/BglII) was cloned into the mCherry-tagging plasmid cut with SpeI/BamHI to obtain pL1419.